Chefs know a lot about kitchen organization tricks. I grew up with one (my mom) and here are the hacks I’ve learned from her about organizing the kitchen. My mother is a professional chef. Inevitably, she knows a thing or two about kitchen organization – it’s a must skill in the cooking business. And as such, the kitchen in my childhood home was always well organizer too. I’ve lived in a place where a misplaced salt cellar could cause me grounding. Ok, I might be exaggerating, but I did pick up a trick or two of where things should go in the kitchen. I’ve realized that I do have a bunch of tricks and organization must-dos that a neat kitchen should have. So, I’ve sat down and made a list of things that my mom always did and told me to do. It turns out there’s a specific reason why my kitchen is always so organized without effort. Hopefully, these tips will help you organize your kitchen better too. In our kitchen, we’ve had a whole cabinet of empty plastic containers and glass jars. Everything went into them. From spices to dried products and even small kitchen utensils. They were all transparent and labeled. It was always obvious what was where and everything had its place. Other than the containers and jars, we’ve always had plastic bins to group similar things. So a bin could contain all spices for Asian cuisine, and you could easily access them and have everything in one place when needed. Among other types of containers, my mom has these pretty mason jars to store various dried products, etc. And I’ve always found them beautiful. They stood on open shelves or neatly stacked in the corner on the countertop. I couldn’t help myself but open them from time to time to check them out because they looked so attractive. If that’s not a great kitchen decor hack, then I don’t know what is! Use painters tape and marker to label all your containers. It’s only good sense to keep track of everything. My mom used to note down dates too for products with longer storage term, so it’s obvious how fresh it is and when you need to purge it. I guess this is obvious, but it’s a golden rule of efficient use of products. Anything you put first in the cupboard or the fridge has to go first when you need something. As such, you should always try to move new items to the beck so that the products that are already opened can be accessed first without much thought. 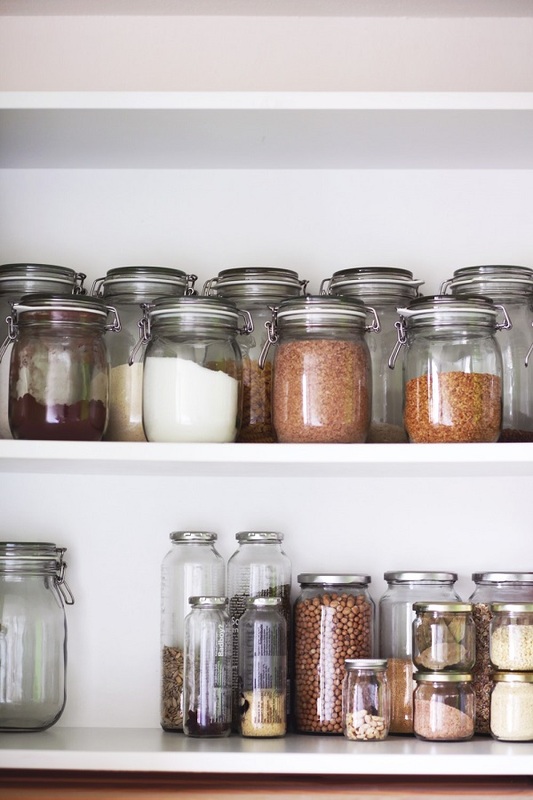 Sorting and grouping everything in the pantry is a neat trick to keep everything under control and stress-free. So whenever you’re about to cook a recipe you can easily gather your ingredients and do it fast. You can get as detailed as grouping by cuisine type, spice flavor, etc. It requires some thought and initial effort but once you get your system down it will be a life saver. Speaking about getting new products, we’ve always had post-it notes on our fridge. These days we use a dry erase board to be efficient. You can get a magnetic board and stick it to the fridge door. Then always write down anything you put in, and erase everything that you use up. Never put knives in a drawer. I don’t know how many times I’ve got “the talk” before I stopped accidentally doing that. It’s unsafe and inconvenient at the very least. Get an excellent wooden rack for the knives and keep it on the counter. A magnetic strip on the backsplash is a good solution too. Talking about knives, they should always be sharp. It might seem counter-intuitive, but you are more likely to cut yourself with a blunt knife that slips than a sharp knife that cuts with precision. So get a handy sharpener and have it always near your blades. You can even invest in an electric sharpener. You need more than one cutting board and don’t you dare mix them up. You need at least one plastic board for raw meat and a few wooden ones for veggies, greens, anything strong flavored or sweet. Have them in different color or styles, so you always know which is which. And when it comes to storing cutting boards, my mom used to always keep them on the microwave. They were always accessible when needed and out of the way when stored. You should never ever store any spices or products near or over the oven. Yes, you need spices accessible when cooking but make sure they’re out of the way of heat and steam. I can’t even begin to tell you how many times I’ve misplaced them and the consequences of it (to the spices and me). Plastic containers all the way. That’s the only way to organize your fridge quickly and mess-free. Use them, stack them, group them by product type and use, and label them. Everything has its place in the kitchen. And everything has to be quickly accessible when needed. It’s so important as speed matters in the professional kitchen, and it’s useful at home. So keep the ladles, spatulas, wooden spoons near the stove and everything else further away. Another obvious tip but tell that to my milk steamer that projected from the top shelf on a tiled floor. Goodbye steamy, you served well. Anyway, it’s just common sense. You will drop it on the floor when trying to reach it or when taking nearby things; it’s only a matter of time. My mom could make the most delicious omelet in a few minutes, and I was always astonished at how fast she would do it. It turns out, it’s all about having the ingredients and tool for your go-to always ready to access in one place. So put your last-minute meal kit together and always have it handy. This is pretty common sense and easy, but you have to do it. Always have two bowls for two types of waste – garbage, and compost. It will just save you the time of going over the trash multiple times.